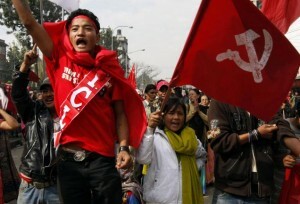 Supporters of former rebel Communist Party of Nepal (Maoist) shout slogans during a protest rally in Kathmandu. Mattia Gallo: Has the international financial crisis of 2008 had an impact on Nepal? What are the social economic conditions of Nepal? What are the main economic and social problems of the country? What are the major economic and social problems of the city of Kathmandu? Bikkil Sthapit: Nepal has not faced any direct impact, so far, from the international financial crisis of 2008. This is because its financial market is not open to short term portfolio investments from abroad. But there have been indirect impacts in the service sector, like IT, tourism, etc. which covers almost half of the GDP. On the contrary, the devaluation of dollar in the international market has benefited the country due to the drastic fall in global oil prices from $149 to $60 per barrel as the government was incurring huge losses that added to the fiscal deficit that was 10 billion rupees at its peak. Without that, the government would have to pour all of the surplus of internal revenue after meeting its regular expenditures. With the phenomenal depreciation of the Nepali Rupee against the dollar, many more imports will come from India at the cost of trade diversification. It is because we have a fixed exchange rate with India. And also the Bilateral Investment Promotion and Protection Agreement (BIPPA) with India is a threat for most of the national investors and small traders inside the country. Having open borders on three sides with India, it is more prominent to have direct trade and investment hegemony resulting in the Indianization of the national economy which can be seen as its geo-political and geo-economic side effect. Our economy is highly dependent on remittances received through economically active emigrant citizens. It is sad to see how the active work force is forced to leave the country as we can’t ensure them work. Every day 1500 or more young Nepalese go abroad seeking employment opportunities and around 2,000 people are presently seeking permission to go abroad every day, according to the Department of Foreign Employment. It is due to political turmoil, sluggish growth in jobs, an unfavorable business environment within the country and more lucrative salaries and perks offered by the destination countries. Not only is the number of people flying abroad for work high, but also the ratio of people migrating to the major cities is comparatively high. It is almost unlivable in the major cities like Kathmandu, the capital city, where the daily amenities are simply unmanageable. Most of the businesses are dependent on profit made from the commission on products imported from elsewhere. So the entire market is fragile and dependent on the exporters. The entire economic scene looks the same in the national level too. Our imports are more than the exports and our revenues are less than the expenses. MG: In Nepal, agriculture is the main activity, and there are many rural communities. What are the major problems of the communities and farmers? BS: Statistics shows that the agricultural sector contributes to one third of the GDP comprising 67% of the active labor force. On the contrary, 67% farmers and 11% agricultural laborers are impoverished. The production system in Nepal is still subsistence based and not yet market oriented. There has been no national program to accumulate these scattered fragmented farmers into one big national policy for mass production. In other words, agricultural research is not prioritized in the government funding which results in the lack of proper planning for agricultural commercialization. The inadequate physical structure, lack of modern technologies, high priced fertilizers that need to be imported, and feudal land ownership, are among some of the major problems of the communities and farmers in Nepal. MG: You are part of the Communist Party of Nepal Maoist, CPN Maoist, which separated from the UCPN Maoist in 2012. Why this division? In late autumn, on November 19, the election of the Constituent Assembly of Nepal was held. The party CPN – Maoist decided to boycott this vote. What are the reasons why they chose to boycott? BS: If you study the revolutionary line that the party has taken, its actually the UCPN(Maoist) who departed from our party. We just had to reform our party with a different name. There have been several blunders made by Prachanda and Baburam’s faction which were far beyond the party’s line and policies. When Prachanda was the party president and Baburam the prime minister there were various activities carried out in a very short span of time which sought to erase the entire achievement of the Maoist movement. The Prachanda/ Baburam faction returned acres of land captured during the People’s War to feudal landlords, they discharged the Nepal Army to all seven divisions of People’s Liberation Army and disarmed them in a night, they dissolved the strategic Constituent Assembly and went for another round of elections without establishing the achievements of our 10 year-long People’s War, people’s movement and the Madhesh movement. There is a serious right neo-revisionist deviation in both Prachanda and Baburam. Although they had played a positive role during the course of the revolution and the great people’s war, a conclusion has been drawn up that they have undergone a serious deviation reflected in every realm of theory, politics, philosophy, strategy, tactics and conduct as well. A reformation of a new revolutionary communist party was a must when the deviation that was seen in the leadership manifested in rightist liquidationism, class and national capitulationism. The mandate of People’s War and people’s movement wasn’t made after the first elections. CPN(UML) lifted their support of the Maoist government and along with the Nepali Congress almost every move of the Maoists was blocked. But it became fatal and more counter-revolutionary when the Prachanda-Baburam faction continued to favor the policies of the right-wingers. The state restructuring and the form of government and electoral system, including some other disputed issues in the CA, led it to be dissolved without promulgating the constitution. This was a boon for the counter-revolutionary forces in order to counter the Maoist force as a whole, resulting in a re-thinking of the already agreed-upon issues like federalism and secularism. These disputes would not be solved in the second round of elections and we understood that opting for the elections would merely be a political drama that imitates bourgeois parliament worldwide. Taking part in the elections is the least strategic path any revolutionary party can think of when there is an acutely unfavorable revolutionary environment. It is almost impossible to defeat the parliamentary messiahs in this bourgeois parliamentarianism. MG: Nepal is a country that borders between India and China, two economic giants. What are the relations between Nepal and these two countries? Are there problems in the relationship with these two countries? BS: Although Nepal borders with India and China, the relation with each of these countries varies due to its cultural and economic aspects. Nepal has its dominating treaty signed during the Rana Regime, popularly known as the 1950 Indo-Nepal Treaty of Peace and Friendship. It still holds Nepal back from being a sovereign nation in trade and security issues. Article 5 of that treaty states that “the government of Nepal shall be free to import, from or through the territory of India, arms, ammunition or warlike material and equipment necessary for the security of Nepal. The procedure for giving effect to this arrangement shall be worked out by the two Governments acting in consultation,” which basically means that without Indian consultation it would be a breach of the treaty and unacceptable to our Indian counterpart. Diplomatically, it is no less than how an Imperial nation treats its colony. Regarding relations with China, Nepal respects the ‘One China’ policy and carefully manages the anti-China movements inside its borders. However this issue remains complicated as major anti – Chinese Tibetan camps lie in India and the Nepalese land can be their best battlefield. Maintaining equidistance with both countries seems beneficial and lethargic at the same time. MG: One of the political activities in which you are involved is the “Revolutionary Art Movement” in Kathmandu. What is this movement? What are its aims? What are its activities carried out in the capital of Nepal? The ‘Ndrangheta and Slovak Politic ..
‘’Bread, jobs and freedom”: A ..
Interview with “Prasvet” edi ..
Anti-militarisation protests in Japan. A ..
Lebanon’s Garbage Politics. And in ..
BS: Revolutionary Art Movement is an independent movement that brings together artists of various forms to work in support of the revolution. We bring together painters, artists, musicians to perform their form of art that will uplift the hopes in people about the possibilities of a revolution. So far we have done some mural paintings, stencils and spray paintings in order to promote the people’s movement and support revolutionaries all around the world. Bikkil Sthapit, from Kathmandu, Nepal, is a community activist, photographer and freelance journalist. He is an Editor for Ignite South Asia. He is also a coordinator of the Marxism Learning Centre of Nepal and Revolutionary Art Movement in Kathamndu.Struggle in Nepal. Mattia Gallo is an Italian journalist and media activist. He is from Cosenza, a city in a region of Calabria in South Italy. He wrote, and in some cases continues to write, for newspaper and alternative media of his region (Ciroma.org, Mmmasciata.it, Tamtamesegnalidifumo, Il Quotidiano della Calabria, Fatti al Cubo, Esodoweb). He has published several articles on Italian alternative media of extra-parliamentary movements as Dinamo Press. At present he works with an Italian alternative sports media (Sportallarovescia) and collaborates with Global Project, an Italian platform of extraparliamentary movement of the radical Left in Italy.